Harrisonburg, VA – Earlier this week, researchers from James Madison University and the College of William and Mary appeared on WMRA's Virginia Insight to reveal what they've been discovering about how people come to believe what they believe. Lexington, VA – The subprime mortgage crisis of 2008 involved more than just less-than-qualified applicants eager for a deal on a mortgage. Some lenders engaged in fraudulent practices designed to deceive homeowners and mortgage brokers. Earlier, Bob Leweke asked Mike Hudson, a reporter with the Center for Public Integrity, for examples of these subprime predatory sales practices. Staunton, VA – WMRA's Tom Graham sat down with Steve Nichols, who heads up the school division for Staunton City schools and has just been named by the University of Virginia as its "Superintendent of the Year." Charlottesville, VA – If you know anyone who ever consumes beef, pork, or lamb -- you may want to make sure they know about new findings coming out of the University of Virginia. WMRA's Tom Graham has been tracking the latest developments. 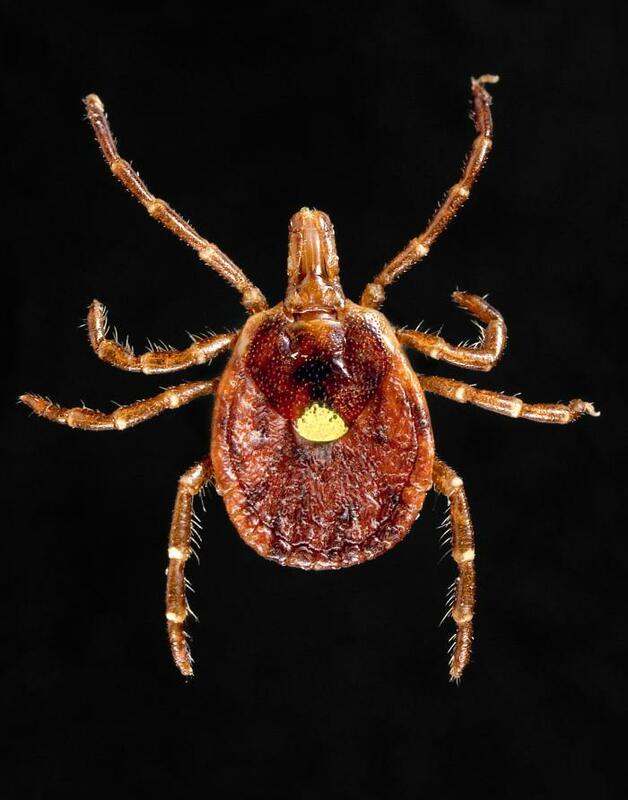 He tells us that ongoing research into a serious type of tick-induced food allergy could be especially important to anyone who spends much time "out in nature." Winchester, VA – Monday evening on All Things Considered you may remember hearing about the results of a study by the Bill and Melinda Gates Foundation, which found that public libraries nationwide continue to expand their digital services while facing budget cuts and shortened operating hours. And libraries in our area are no exception. Waynesboro, VA – Ed Clark is the president and co-founder of the Wildlife Center of Virginia near Waynesboro. He recently returned from a 6-day trip to the Gulf of Mexico, sponsored by the Humane Society, to get a first-hand look at the damage to wildlife and to the habitat there. On tours by helicopter and by boat, Clark traveled along the coast of Louisiana, Mississippi, and Alabama. Richmond, VA – Virginia's General Assembly reached its "Crossover Day" earlier this week, which is the point by which legislation other that budget matters had to have been approved by either the State Senate or the House in order to stay alive this session. WMRA's Tom Graham was spending time at the state capitol again this week and spoke with Bob Leweke about the main focus in Richmond. Charlottesville, VA – Chances are good you've been talking about the weather. WMRA's Tom Graham has too, with a number of people who have been viewing this winter from a variety of perspectives. Harrisonburg, VA – Classical violin virtuoso Joshua Bell will be appearing at the Paramount Theater on February 10, 2010. In anticipation of his appearance in Charlottesville, Bob Leweke spoke with Mr. Bell about his recent work and his attempts to bridge the gap between classical and popular music. Virginia – This morning, Tom Graham and Martha Woodroof set out to gauge local reactions to last night's State of the Union Address. Martha Woodroof gathered reactions at the Heritage Farmers Market in Harrisonburg and Tom Graham spoke to patrons of Bodo's Bagels in Charlottesville. Charlottesville, VA – A recent forum on health care reform turned out to be not quite as advertised. But WMRA's Tom Graham says it still proved educational. He attended the session in Charlottesville late last week, then did a little digging into its origins. Charlotteville, VA – Could the recession hold a silver lining for some American families? Brad Wilcox, Director of UVA's National Marriage Project thinks so and spoke with WMRA's Tom Graham about some new trends. Richmond, VA – After three consecutive years of significant belt tightening... Virginia's budget is about to get even tighter. The Virginia General Assembly opens its 2010 session next week, and because of the economic downturn, lawmakers must decide which government services will have to be cut... or eliminated. WMRA's Tom Graham has been tracking preparations for the upcoming session. Charlottesville, VA – "Virginia needs to do more... much, much more for children with mental illness." That's the claim of a new statewide coalition calling itself the Campaign for Children's Mental Health. The coalition is made up of more than a dozen advocacy and medical groups, including Voices for Virginia's Children, a non-profit that has won high praise from state lawmakers in recent years for work on a wide variety of children's issues. How are we distributing the scarce amount of H1N1 vaccine available in Virginia? Doug Larsen, director of the Central Shenandoah Health District spoke with WMRA's Martha Woodroof about the mechanism in place to distribute the vaccine. Note: It is suggested that you call any center before you visit to check on current vaccine availability. Richmond, VA – A new administration is coming to the Virginia Governor's mansion in a few weeks. So far Republican Governor-elect Bob McDonnell has not announced selection of any of his cabinet. But in recent days, he has appointed key members of his transition team, and made a few low level staffing selections. Charlottesville, VA – James A Joseph, a professor at the Sanford School of Public Policy at Duke University, and a philanthropic expert, is coming to Charlottesville to help celebrate National Philanthropy Day. In anticipation of his Mr. Joseph's visit, Bob Leweke spoke to him about philanthropy and asked about the difference between making a small donation and the idea of philanthropy, which some people see as the privilege of the rich. Richmond, VA – If you were happy with this week's election in Virginia, you probably want to know what Republicans did right so they can do it again in the future. If you're not happy, you may want to know what Democrats did wrong so they can avoid it in the future. Harrisonburg, VA – Tuesday, November 3rd, voters across the Commonwealth will choose Virginia's next Governor. A number of statewide polls are predicting a major victory for Virginia Republicans. How dependable are those predictions? WMRA's Tom Graham sat down with political scientist Bob Roberts to get some perspective. Harrisonburg, VA – There's a lot of controversy surrounding the teaching of the theory of evolution in public schools. sSo what, exactly, is the Theory of Evolution? Richmond, VA – Virginia's two major party candidates for governor faced off in debate, Monday October 12th, in Richmond. WMRA's Tom Graham has highlights from the debate. Harrisonburg, VA – Virginia has thirteen representatives in Congress. Two U.S. Senators and eleven members of the House. For them, as for all members of Congress, the divided debate about health care remains top of mind. However, WMRA's Tom Graham discovered that partisan bickering is not the only thing currently taking place on Capitol Hill. Harrisonburg, VA – U.Va. political Scientist Eric Patashnik's research on evidence-based medicine has become part of our national health care debate. Dr. Patashnik was one of Tom Graham's guests yesterday on WMRA's Virginia Insight. Reporter Martha Woodroof listened in and prepared this report. 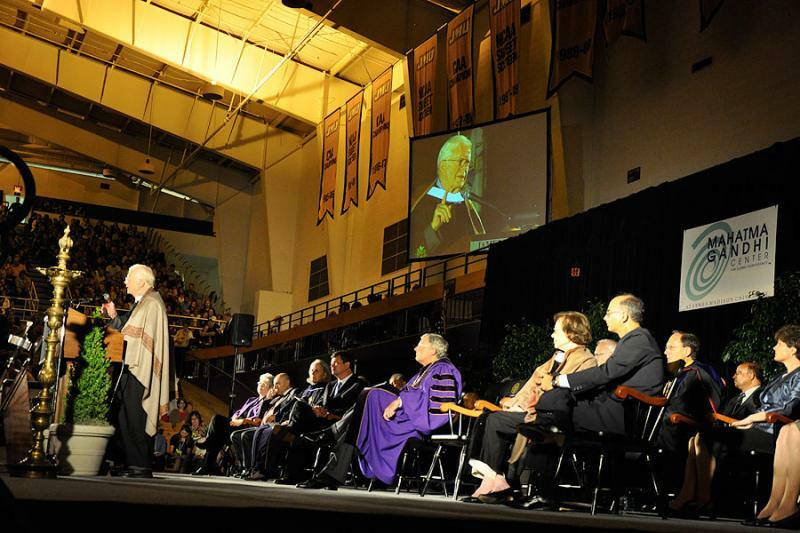 Harrisonburg, VA – Sixty-three hundred people packed James Madison University's Convocation Center last night to see Former President Jimmy Carter and Former First Lady Rosalynn Carter receive the Mahatma Gandhi Global Nonviolence Award. After accepting the award, Mr. Carter spoke about the path to Peace in the Middle East. WMRA's Martha Woodroof was there. Charlottesville, VA – Don't pick a fight with an elderly lady. Especially if a lot of people admire her volunteer work. That may be the lesson the Virginia Department of Corrections has learned... now that it has reversed its ban on a popular book program. WMRA's Tom Graham has the story of the woman behind the Books Behind Bars program, and the battle she waged to keep it going. The New Confusion over the Meaning of the Word "Publish"
Harrisonburg, VA – What does it mean to publish these days? Will print outlets consider work that's been on the Internet? When, exactly, does publication take place? WMRA's Martha Woodroof tried to figure this out. Harrisonburg, VA – It's nerve-wracking to start a business in the best of economic times, and 2009, economically speaking, has been characterized as the worst time since the great depression. Up to June this year, 56 new business licenses were issued by the City of Harrisonburg. WMRA's Martha Woodroof takes a look at what it's like to go into business this year in, and around, the Burg. Charlottesville, VA – A new University of Virginia study, conducted with the Washington based Urban Institute offers a host of suggestions for combating America's obesity crisis, including a change in tax structure that would make healthy eating less expensive, and unhealthy foods harder to come by. Dr. Tim Garson, a pediatric cardiologist, is one of the authors. Dr. Garson also serves as Provost at UVA.